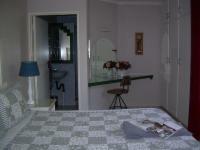 Queen beds, DSTV, En-suite, Shower only, Balcony/patio, Garden views, Air-Conditioning, Television, Tea and Coffee Facilities, Bar Fridge, Wi-Fi, Internet Connection, No Smoking in Rooms. 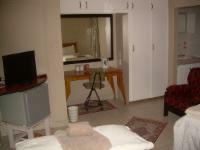 DSTV, En-suite, Single beds, Air-Conditioning, Television, Tea and Coffee Facilities, Bar Fridge, Wi-Fi, No Smoking in Rooms. If cancelling 1 day before arrival, forfeit 100% of the booking total. If cancelling 2 days before arrival, forfeit 50% of the booking total. Check in: 14:00. Check out: 09:00 extension till 10:00 on request.